To join in the celebration of the 150th anniversary of the table’s creation by Dmitry Mendeleev, BLS has created our own periodic table! Since we agree with the U.N. coordinator, our table goes beyond chemistry and includes Science, Technology, Engineering, and Math (STEM) occupations. Don’t worry, our table includes chemists, too. Workers in STEM occupations use science and mathematics to understand how the world works and to solve problems. We thank the Nebraska Department of Labor for the original idea for this table. There were nearly 8.9 million STEM jobs in May 2017, representing 6.2 percent of U.S. employment. Employment in STEM occupations grew by 14.5 percent, or 1.1 million jobs, between May 2009 and May 2017, compared with 8.8 percent net growth in non-STEM occupations. Employment in STEM occupations is projected to increase by 10.9 percent from 2016 to 2026, and this growth is expected to result in 1.0 million new jobs. 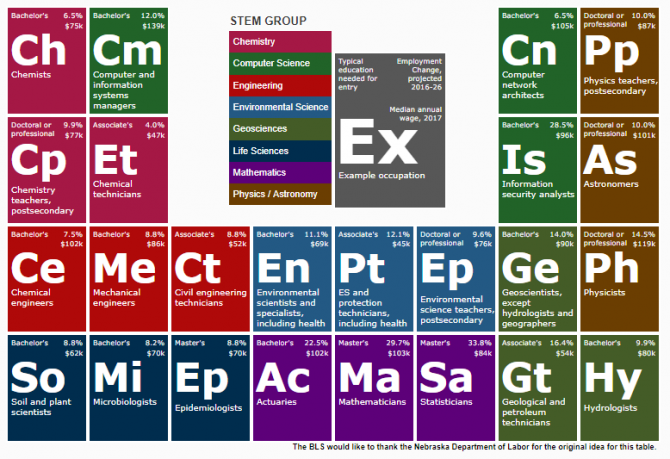 Our BLS Periodic Table of STEM occupations highlights a couple dozen jobs. Contact our projections information folks by phone, (202) 691-5700, or email. Whatever your occupational information needs — whether STEM or non-STEM — we have a stat (or several) for that! I am a neuroscientist and my background consisted of hard-core sciences to include Chemistry, physics, mathematics and physiology. I love Chemistry as believed by some scientists to be the foundation of life. I love the periodic table. I am amazed that even within few years since I studied Chemistry, the periodic table has expanded to include newly discovered elements. Saying that I absolutely enjoyed the concept of Periodic table applied to beyond Chemistry and to include science, technology, mathematics and more. I am intrigued to see if I can apply the same principle to neurophysiology and brain function. My pet subject is memory training and brain’s executive functions in older normal adults and those with mild memory impairments. I will be grateful for any thoughts on the matter.